We are a family run Motorcycle Training School, who offer complete training with friendly & expert tuition at very competitive rates. Our fleet of school motorcycles include 50cc scooters, Yamaha SR 125cc, Yamaha YBR's 125cc, Suzuki's GS 500cc, Yamaha XJ6 and Suzuki Gladius. (Some of these have been professionally lowered to cater for smaller rider's). 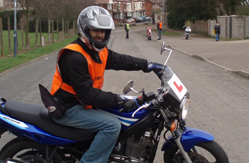 We offer courses for the complete novice to the advanced rider, to Instructor Training. All necessary safety clothing can be provided at no extra cost for the duration of your course. Our aim has always been to provide the highest possible standards in training whilst remaining focused on each customers individual needs. Whether you have previous experience or you are a complete novice, we can and will help in building your confidence. We pride ourselves on being both patient and attentive. 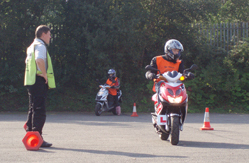 Our Instructors are DVSA, ROSPA & IAM qualified with a vast range of riding experience, offering training in a friendly and professional atmosphere and are always prepared to adapt our courses. It is these qualities that lead to our exceptional pass rates and outstanding customer satisfaction. We provide Training 7 days a week, small groups only or one to one if preferred. All of our motorcycles are maintained to the highest standards by professional motorcycle dealers. We aim to provide a calm stress free experience. New riders can learn in an off-road environment before venturing out on to the road for the first time.